Friday 28th April, Middle Mill, Lower Castle Park Colchester. Held at 7.30 in lower Castle Park by the water wheel and cricket club gate. This is the annual workers memorial day event. A chance to remember colleagues who we have lost, and remind ourselves of the importance of continuing to campaign for safer work places. There was a short ceremony, then beer and sandwiches in the Victoria Inn. William Francis Burton (1907-1995). 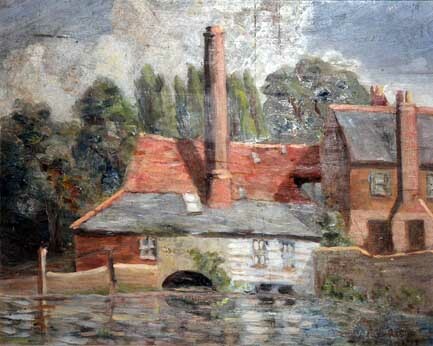 Middle Mill, Colchester 1947. Oil on board. www.ian-partridge.com ~ Web page content photography and design ~ Copyright ©2017 ~ Ian Partridge.